Lately, I’ve become obsessed with wearable technology. It’s fascinating stuff-imagine taking a picture with a simple command or composing an email in the air. Sound impossible? It’s not-it’s the world of wearable technology and it has the potential to change our world. I must confess, I didn’t understand what it was until recently. In case you aren’t familiar with it either, wearable technology is about wearing devices that do everything from monitor personal body performance or help perform tasks usually reserved for a computer or smartphone. You might have heard of the Fitbit® which is a small wristband that tracks your nutrition and physical activity-this is a great example of wearable technology. 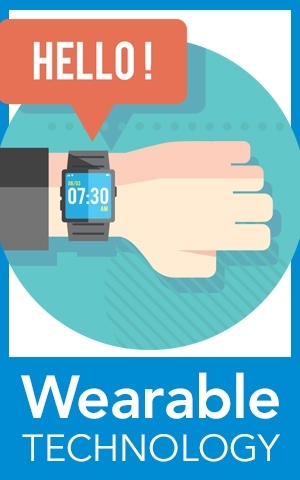 Wearables come in many forms-from eyeglasses, rings, watches, clothes and more. Have you heard of Google Glass®? Basically, it’s a mini computer built into a pair of glasses. When wearing them, you see a mini tablet in a small screen to the left of your eye, enabling you to search the Web or read emails-all without anyone noticing. What about a wearable hoodie? Yes, there’s a Smart Hoodie on the market that responds to voice or gestures to send texts and emails. Don’t feel like grabbing your phone to text a friend? As long as you’re wearing the hoodie, there’s no need. Does wearable jewelry appeal to you? You could wear earrings that are actually hearing aids or a watch that tracks every aspect of your health and activity. Even rings can be wearables-one ring is worn on your thumb to make it easier to use a computer. It’s called a ThumbTrackâ¢ and it’s being called the world’s smallest wearable mouse. It does everything that can be done using a traditional mouse, but you don’t have to risk pain or injury to the hand and wrist. If that doesn’t impress you, how about using a ring to check incoming calls and messages without touching your phone? That is what the Smarty Ring does, in addition to proving get real time updates from Facebook®, Twitter® and Skype®. What else can be a wearable? It seems like there’s no limit-shirts, watches, shin guards, wristbands, socks, shoes, contact lenses, caps and head bands-and that’s just the tip of the iceberg. Not to mention that the things wearables can do are mindboggling. Did you know there’s a wearable device that can translate languages in real time and make it seem like you have a personal translator? What about wearable devices that can help guide the blind and tell them when to turn right and if there’s an obstacle approaching? I think you get the point-it’s amazing and the industry is still in the infancy stage. One can bet that there will be even more devices that enter the market in the upcoming year. Yet the more I learn about wearables, the more I wonder if they will make our world better. No doubt it will make things easier, but at the same time, it will add yet another layer of technology that keeps us from interacting with others. It may further limit the need for personal contact as we become more entrenched and reliant on technology. Gone are the days of asking a passerby for directions on the street. There’d also be no need to learn another language, since you might have a translator at your fingertips. And what about actually meeting someone face to face? Will wearable technology eliminate the need, connecting people more virtually than ever before? Then, of course, there’s the whole issue of personal privacy. How will you know if someone is recording your conversation, taking a picture or making a video? The short answer is you won’t, and that makes me uneasy on multiple levels. I don’t have the answers to these questions, but I do know that wearable technology will change the world. Like anything, there will be pros as well as cons. We will have to wait and see if the pros eventually outweigh the cons, and whether or not it’s something that makes life easier or more complex. Who knows, maybe someday my shirt might will tell me I’m lost and I’ll never have an excuse to be late again. Anything is possible with wearable technology.